WASHINGTON, Nov 8 2012 (IPS) - Calls are mounting for the world’s big fishing powers to stop subsidising international fleets that use destructive methods like bottom trawling in foreign coastal waters, drastically reducing the catch of local artisanal fishers who use nets and fishing lines. Such subsidies total 27 billion dollars a year, with nearly two-thirds coming from China, Taiwan and Korea along with Europe, Japan and the United States, according to a University of British Columbia study. Most go to building the ever-more-efficient ships that are required to catch ever-dwindling populations of fish around the world, with yet more subsidies going to offset their growing consumption of fuel as they venture ever farther and deeper to fill their holds. The result, says Dr. Rashid Sumaila, lead author of the UBC study, is that taxpayers are funding the depletion of the world’s fish populations and the impoverishment of coastal communities abroad. “A lot of the fish eaten in Europe, the United States and Japan comes from other countries, mostly poor ones,” because the developed countries long ago overexploited their own waters, he told IPS in a telephone interview. A senior United Nations official agrees, charging last week that developed countries, which eat three times as much fish per capita as poor ones, are are depleting the oceans and depriving coastal fishermen in developing countries of their livelihood and coastal populations of food. 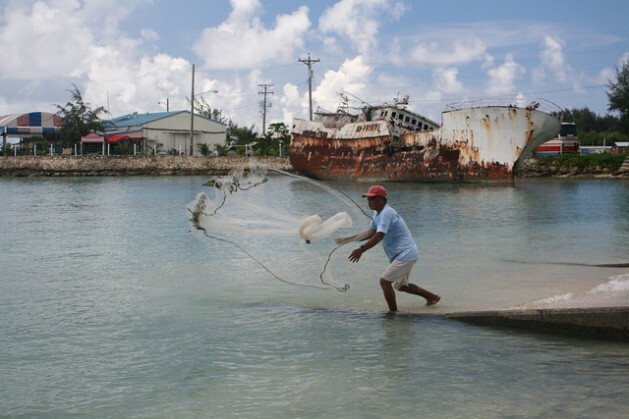 “Without rapid action” to stop destructive practices, “fisheries will no longer be able to play a critical role in securing the right to food of millions,” the United Nations Special Rapporteur on the Right to Food, Olivier de Schutter, said. The U.N. report, entitled “Fisheries and the Right to Food“, notes that international conventions ranging from the Law of Sea to the World Trade Organisation have long called for the ban of subsidies to fleets that fish unsustainably, as most today do. Meanwhile, the money the industrial fleets pay developing countries to fish in their waters goes to often corrupt governments, while the impact is felt by poor coastal communities. Not only are most industrialised ships uneconomical if they aren’t subsidised, they also provide far fewer jobs: 200 for every 1,000 tonnes of fish caught, versus 2,400 jobs for 1,000 tonnes caught with artisanal methods using small boats, according to another study cited in the U.N. report. Globally, that translates to a half-million industrial fishermen catching 30 million tonnes of edible fish, discarding at sea another 15 million tonnes, and burning 37 million tonnes of fuel. The artisanal fisheries also catch about 30 million tonnes of seafood. But they employ 12 million people, discard almost nothing, use a seventh of the fuel and receive a fifth of the subsidies. Also, the nutrition they provide plays a much bigger role in the health of their local populations than the more expensive fish sold in developed countries. Indeed, nearly all of the fish the small-scale fishers catch is eaten, while the industrial ships, in addition to the 30 million tonnes of edible fish they take, also haul out another 35 million tonnes of everything from other fish to plankton for transformation into oils or fish meal, which are used for fertiliser and feed. The result: many of the non-food fish that the edible fish depend on have disappeared, along with vast amounts of plankton, the base of the food chain. While on average 95 percent of rice and 80 percent of wheat are consumed in the country in which they were grown, only 60 percent of the world’s fish is sold in the country in which it was caught, according to the report. The rest is exported. The industrial fleets pay governments anywhere from two percent (Guinea Bissau) to six percent (the Pacific islands in whose waters half the world’s tuna is caught) for the right to fish in their waters. In comparison, governments receive 30 to 70 percent of the value of oil extracted from their land from the foreign oil companies that extract it. Some countries have fought back. In May, Senegal’s 50,000 artisanal fishermen, angry that their catch was reduced by destructive European trawler fleets and backed by NGOs like Greenpeace, forced a new government to cancel fishing licenses to foreign fleets granted by the previous one. Namibia, for its part, has largely banned foreign fleets from its rich waters since it became independent in 1990 and has developed its own industrial fishery. The Maldives, in the Indian Ocean, have closed its tuna fishery to foreign industrial fleets in favour of small-scale pole-and-line vessels, which yield better-quality fish. The U.N. report called on coastal governments to negotiate new agreements with foreign fishing fleets that would keep those away from the coasts so the sea bottoms can heal while small-scale fisheries recover. “These resources must be turned away from over-exploitation and toward the benefit of local communities,” de Schutter said.